If you’re a homeowner, you may be tempted to handle heating repairs on your own. However, this may not be the best course of action to take. Heating repairs take specific knowledge and training to be carried out properly. For your benefit and peace of mind, trust only Smiley’s Heating & Cooling. Our team is dedicated to delivering the best possible HVAC solutions. From doing furnace repairs to servicing heaters, we take our work seriously and perform only in the best interests of our clients. Even if you’re the savviest DIY enthusiast, you’ll have to enlist the help of professionals at one point. These experts don’t simply tinker and attempt maintenance and repairs themselves. They have undergone rigorous training in handling Virginia Beach heating systems. 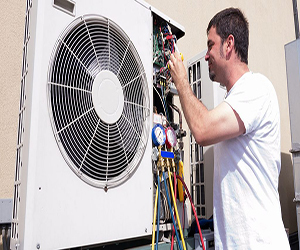 With their help, you can make sure that your Virginia Beach heating and cooling units get the right repair and servicing. Virginia Beach heating professionals can provide quick diagnosis and take prompt corrective action. Those with little technical experience may be able to locate the source of Virginia Beach heating problems if given enough time. That said, finding the reason behind Virginia Beach heating issues is only the first step to fixing them. You still have to identify the best way to address any of these Virginia Beach heating problems. That’s where Virginia Beach heat repair professionals come in. Virginia Beach heat repair professionals understand the ins and outs of Virginia Beach heating systems. When you work with these Virginia Beach heating experts, you can use their years of experience to your advantage. These Virginia Beach heating professionals won’t simply help you get to the root of your Virginia Beach heat system problem. They’ll also determine and deliver you the most efficient Virginia Beach heating solution so you can return to your normal routine as soon as possible. Learn more about heating problems here. Virginia Beach heating professionals can deliver a reliable resolution the first time. If you have little to no experience in repairing heaters, doing it can cost you more time than it should. The work may also turn out to be a botched Virginia Beach heating repair, which may escalate into more serious problems. Virginia Beach heating technicians spend a considerable amount of time practicing their work and developing their skills. This means that when they take on Virginia Beach heating repairs or tune-ups, they’re likely to get the job done right the first time. The fewer the errors, the sooner the completion of the Virginia Beach heat repair job and lower the cost incurred. It’s important to remember that Virginia Beach heat repair professionals consider client satisfaction as their top priority. To help homeowners feel more confident in their decision, these Virginia Beach heating experts may even set warranties and other safeguards in place. Virginia Beach heating professionals can help reduce your heating bills. You may think you’re saving money by going DIY, but this isn’t always the case. Heaters can perform at less-than-optimum levels if they aren’t repaired or serviced properly. When heaters malfunction, they’re not efficient like they’re supposed to and may even draw more electric power than they should. This may result in higher Virginia Beach heating bills and greater long-term expenses. Virginia Beach heat repair professionals have the expertise to ensure that your Virginia Beach heating unit is performing at its most efficient. When your Virginia Beach heating unit is in top condition, you can keep your house warm and cozy without wasting any precious energy. The improved efficiency of your Virginia Beach heating unit also helps reduce greenhouse gas emissions. Virginia Beach heating professionals can give you helpful maintenance tips. When it comes to handling and caring for heaters, you can rely on Virginia Beach heating professionals to provide sound and invaluable advice. These professionals have a wealth of experience to draw on for useful knowledge about Virginia Beach heating systems. They’ll help you learn more about the workings of your Virginia Beach heating unit and the proper ways to maintain it. Remember: Calling in Virginia Beach heating experts doesn’t equate to admitting defeat, especially if you’re the handy type. It just means that you want to have access to quality workmanship and consultation that’s necessary to keep your Virginia Beach heating unit in the best condition possible. Virginia Beach heating professionals can help increase the lifespan of your Virginia Beach heating equipment. A Virginia Beach heating unit has the average lifespan of 10 to 15 years, but some may start to malfunction way before their expected expiration date. A possible cause of this is poor maintenance of the Virginia Beach heating unit. Homeowners can get more miles out of their Virginia Beach heating system through regular servicing. Some Virginia Beach heating units may even last 20 years with the right maintenance and extensive care. In addition, every year that you extend the life of your Virginia Beach heating unit means reduced eco-footprint from you. Virginia Beach heating professionals are committed to excellence. When you depend on technicians for Virginia Beach heating repairs and servicing, you can rest easy knowing that your system is in capable hands. Virginia Beach heat repair and maintenance professionals can be counted on to perform with a focus on quality and innovation. With years of experience in heating repairs under their belt, these technicians will do whatever they can to address your Virginia Beach heating needs in a timely manner. These experts will also strive to complete the job within your specified budget. Good HVAC contractors will have a representative who’s willing to visit your home before the job begins. This meeting will give them an idea of your needs and requirements and let you gain insight into their work ethic. If the company does send a representative, consider his or her qualities. Is he or she well informed, neat, and clean? Does he or she make you feel secure and comfortable? A good HVAC service representative knows how to start and maintain decent conversations with clients and can answer any HVAC-related inquiries with expertise. Ask the HVAC company about their copies of state licenses, proof of insurance, and workers’ compensation. These documents will help you obtain peace of mind knowing that the contractor has met the minimum-required standards of the industry. They also mean that you’ll be protected if an accident happens or an injury is sustained during the job’s completion. Learn about the history of the HVAC company with previous clients. One way to do this is by reading testimonials on their website. You can also visit rating websites, which rank companies depending on the quality of service they deliver. If you’re not pressed for time, you can meet up with their recent clients face-to-face to talk about their solutions. Click here to read some of our testimonials. Are you looking for reliable HVAC solutions? Your search ends at Smiley’s Heating & Cooling! Our team has a solid background in the HVAC and plumbing industry. We also proudly serve residents of Portsmouth, Norfolk, Virginia Beach, Chesapeake, Suffolk, Hampton or Newport News, and surrounding areas. Contact us to learn more.